If you want to know how to lose weight fast without sacrificing your hard-earned muscle (or your sanity), then you want to read this article. Go about the right way, though, and you can dramatically improve your body composition for a lot less fuss and discomfort than you probably think. That detail makes all the difference, by the way — if you want to build lean, athletic physique, then your number one priority is gaining and maintaining muscle. That’s also why many fitness folk shun all forms of “rapid weight loss” and advocate a slow and steady approach to dieting instead. This, they say, is the only way to lose fat while maintaining lean mass. If you know what you’re doing, you can have your cake and eat it too — you can lose fat quickly (anywhere from 1 to 2 or even 3 pounds per week, depending mainly on your body composition) while losing little to no muscle. You won’t have to starve yourself, swear off all the foods you like, or do torturous amounts of cardio, either. If that sounds too good to be true, I know. It does. But by the end of this article, you’ll have the blueprint, and if you follow its simple steps, the results will speak for themselves. Why Rapid Weight Loss Beats "Slow Cutting"
1. Your metabolism can slow down markedly. 2. You spend more time building little to no muscle. 3. You're more likely to call it quits. But Won't You Lose Muscle If You Lose Weight Fast? 1. Use an aggressive caloric deficit of about 25%. 3. Do a lot of heavy, compound weightlifting. 4. Keep your cardio to a minimum. What's your take on losing weight fast? Have anything else to share? Let me know in the comments below! If you’ve read a fitness magazine or two, you’ve probably heard that losing weight quickly is bad for many reasons. Often accompanying these warnings are theories as to why losing weight slowly (“slow cutting”) is the all-around better choice. Well, this approach does have its positives, mainly that it’s “easier” due to the milder caloric deficit and laxer workout schedule. It has its negatives, too, which revolve around the fact that slow cutting requires that you restrict your calories for long periods of time. Your metabolism is highly adaptive. When you restrict your caloric intake to lose weight, it responds by taking measures to restrict energy expenditure. This is known as “metabolic adaptation,” and is one of the major reasons people “inexplicably” stop losing weight. You see, your body’s primary goal in terms of energy balance (the relationship between the calories you eat and burn) is homeostasis — it wants to match input with output, which results in weight maintenance. It has various physiological mechanisms at its disposal to accomplish this, which is why metabolic slowdown is an inevitable consequence of weight loss, and the longer you diet to lose fat, the more pronounced these effects become. This isn’t harmful in and of itself, but it can lead to rapid post-diet fat gain if you don’t know how to “reverse diet” properly. You’ve probably heard that you can’t build muscle and lose fat at the same time — that you have to pick one or the other. If you’re new to resistance training, or to proper weightlifting, then you can gain muscle while in a caloric deficit. Once those “newbie gains” have been exhausted, though, you have to play the same rules as the rest of us and accept that muscle growth will be stagnant when your calories are restricted. There are a couple reasons for this but the main one is the fact that protein synthesis rates are suppressed when you’re restricting calories for fat loss. Thus, the more time you spend cutting, the more time you spend more or less treading water in terms of gaining muscle and strength. While this might not mean a lot to some folks (i.e. those who have already achieved most of what’s available to them genetically), to those still working to build a physique, it bulks large in the bigger picture. I’ve worked with thousands of people and one for one, the guys and gals that have struggled the most to significantly upgrade their body composition have simply spent too much time in a caloric deficit. In some cases, they’ve tried to “slow cut” over the course of 5 to 6 months (erasing a sizable portion of the potential muscle gain for the year), and in others, they’ve spent many of their weekdays in a deficit to undo the sins of the weekends. In both cases, the net effect is the same: a lot less muscle gain than they expected or hoped for. This is one of the main reasons I recommend that people in the “building” phase of their fitness journey strive to spend as little time cutting and as much time bulking as possible. 3. You’re more likely to call it quits. Even when you know exactly what you’re doing with your diet, being in caloric deficit — even a slight one — eventually gets on your nerves. Physical and mental fatigue set in. Workouts get harder. Hunger and cravings thunder like jungle drums. You have to rely more and more on willpower to stay the course, and the longer you fight this battle with your body’s desire for more food, the more likely you are to flame out and binge. With a more aggressive approach to cutting, though, you won’t be symptom-free, but you won’t suffer, and the shorter duration will keep you focused on the light at the end of the tunnel. But Won’t You Lose Muscle If You Lose Weight Fast? If we’re going to talk rapid weight loss, then we need to start with the elephant in the room: muscle loss. The only way to lose weight fast is starving yourself and doing masochistic amounts of cardio, which burns away a lot of muscle. Eating too little will accelerate muscle loss — this is one of the reasons why “crash dieting” is so unhealthy — and doing too much cardio certainly exacerbates the problem. But how big of a caloric deficit is too big, though? How much cardio is too much? And how do things change with athletic types eating plenty of protein, as opposed to untrained, obese people eating too little? Well, we can look to a study conducted by scientists at the University of Jyvaskyla for a tidy insight. One group ate about 300 fewer calories than they burned every day (~12% below total daily energy expenditure). The other ate about 750 fewer calories than they burned every day (~24% below TDEE). Both were on a high-protein diet and exercising as usual, and after four weeks, the group eating the least number of calories lost 4 pounds of fat and little muscle, while the group in the 300-calorie deficit lost only a little fat and muscle. That is, doubling the size of the deficit resulted in a lot more fat loss, but not muscle loss. This jives with what I’ve experienced with my own body and with the thousands of people I’ve worked with. If you know what you’re doing, you can be fairly aggressive with your caloric deficit without sacrificing muscle. Over the years, I’ve tried many different diet and training regimens when cutting. Some worked better than others, and, over time, I was able to glean workable principles and insights and organize them into an extremely effective and efficient weight loss regimen. With this regimen, you can lose, on average, about a pound of fat per week (more if you’re overweight, slightly less if you’re lean looking to get really lean) without any major hiccups. You shouldn’t have to deal with much in the way of hunger and cravings, your energy levels won’t flatline, and your workout performance will be minimally impacted. Like the athletes in the study discussed above, I reduce my caloric intake to about 75% of my TDEE and, like them, immediately start seeing reductions in fat without any noticeable muscle loss. If that sounds like way too little food to you, don’t worry — when combined with a high-protein and high-carb diet (the next point), it’s not grueling like you’d expect. While the scientific search for the “One True Diet” continues, there’s one thing we know for certain: it’s going to involve eating a lot of protein. The bottom line is study after study after study confirm that high-protein dieting is superior, in every way, to low-protein dieting. And this is especially true when you’re restricting calories for weight loss, as adequate protein intake plays a major role in preserving lean mass. In terms of how much protein you should be eating, this article breaks it all down, but the long story short is you want to eat around 1 to 1.2 grams of protein per pound of body weight. Now, most people have at least heard that a high-protein diet is best for weight loss, but a high-carb diet? Low-carb diets are not better for weight loss, and actually are worse in several ways for us fitness folk. A low-carb diet doesn’t help you lose fat faster. A higher-carb diet results in lower levels of stress and fatigue. A higher-carb diet is better for preserving performance and lean mass when calories are restricted. It’s generally easier to overeat on a low-carb, high-fat diet than a high-carb, low-fat one. If you’re skeptical, I understand. Everywhere you look these days there’s another “expert” spouting off about how carbs are the source of all of our health and fitness woes. Yes, sedentary and overweight people shouldn’t be eating piles of carbs, but that doesn’t mean that lean, physically active people need to play by the same rules. Read: Is a Low-Carb Diet Actually Better for Weight Loss? And if you want to see this for yourself, simply keep your carbs around 30 to 40% of your total daily calories the next time you cut. You might be surprised how much easier and enjoyable it makes the whole process. This style of training is best for both gaining muscle while bulking and preserving it while cutting. And by heavy, I mean that you should work primarily with weights in the range of 75 to 85% of your 1RM. By “compound,” I mean exercises that train several major muscle groups, like the squat, deadlift, and bench press. Doing this will benefit more than your muscle mass, too — it can also help you lose fat faster, mainly due to what’s known as the “afterburn effect” (calories burned long after the workout has ended). In one study, men training with heavy weights had increased metabolic rates for three days after their workouts, and burning hundreds more calories than the group that trained with lighter weights. Research also shows that the big compound movements like the squat and deadlift are the types of exercises that benefit most from this effect. Many people equate cardio with weight loss and figure the more they do, the more weight they’ll lose. Well, while cardio does help burn calories and thus fat, if you do too much while dieting, you’re going to run into problems. Namely, you’re going to lose muscle faster and increase the likelihood of getting snared in the web of overtraining. This is why I’m a big fan of high-intensity interval training (HIIT) — all you need is an hour or so per week to considerably impact your fat loss. You see, even though HIIT sessions are considerably shorter than traditional steady-state cardio sessions, a number of studies show that they result in greater fat loss. In fact, a study conducted by scientists at The University of Western Ontario found that doing just 4 to 6 30-second sprints per day burned more fat over time than 60 minutes of incline treadmill walking (which, incidentally, is another good option if you don’t want to do HIIT — check out this article to learn more). Supplements aren’t the key to fat loss, but if you combine the right ones with a proper diet and exercise routine, you can dramatically speed up the process. Yohimbine is a chemical extracted from a species of African plant, Yohimbe. Studies show that yohimbine can accelerate fat loss by blocking the activity of alpha-receptors in fat cells. 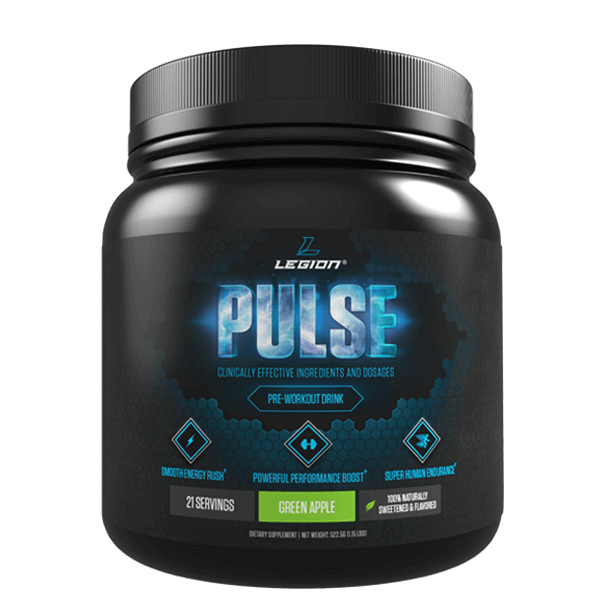 This enables your body to reduce fat stores faster and is particularly useful as you get leaner and are battling with stubborn fat holdouts. There’s a slight catch with yohimbine, though: elevated insulin levels negate its weight-loss effects. If you want to reap its fat loss benefits, you want to use it when you’re in a fasted state. Yohimbine’s benefits don’t stop there, though. It does more than help you lose fat faster. Research shows that yohimbine also improves exercise performance, and it’s particularly effective at fighting off physical fatigue and increasing time to exhaustion. 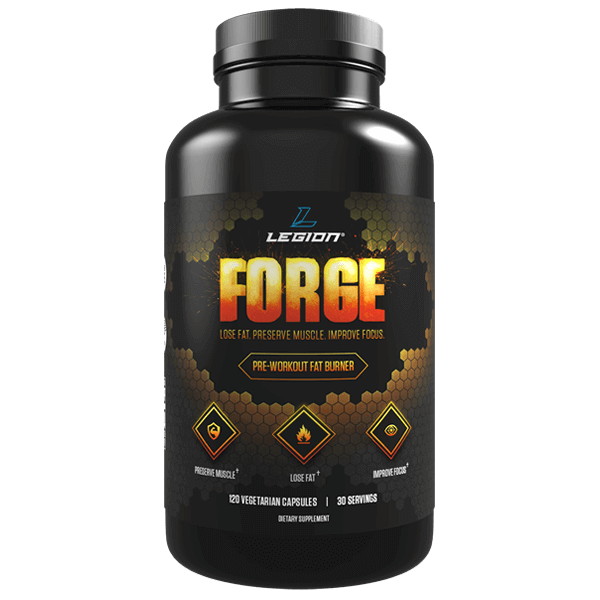 These are the reasons why I decided to include yohimbine in my pre-workout fat burner FORGE, which was made specifically for maximizing fat loss with fasted training. and it increases the feeling of fullness from food. Many companies try to sell you their fat burners by making the process of fat loss sound overly complex. They talk about increasing fat oxidation rates, preserving lean mass, supporting the thyroid, inducing thermogenesis, inhibiting enzymes related to fat storage, inducing enzymes that cause fat loss, manipulating hormone and neurotransmitter levels, reducing water retention, improving nutrient partitioning, and more. Well, the truth is these are all aspects of fat loss, but this type of marketing is little more than an attempt to dazzle you with terminology and scientific half-truths in hopes that you just accept the claimed benefits at face value. 1. You can increase your basal metabolic rate. Your metabolic rate is a “count” of how much energy your body burns throughout the day, and the higher it goes, the faster you can lose weight. This is because when you boil fat loss down to its utmost simplicity, it’s determined by the difference between the energy your body burns and the energy you feed it with food. Expend more energy than you consume over time, and you’ll lose fat. Encourage a cell to produce more energy from carbohydrates and fatty acids. Reduce the efficiency of the process through which cellular energy is produced, thus increasing the “energy cost” of meeting the body’s needs. There are many ways to manipulate those mechanisms and PHOENIX focuses on the most effective methods. 2. You can prevent hunger or cravings from ruining your plans. A major reason diets fail is people just aren’t able to stick to them long enough. Wishes turn into cravings and ultimately binges, which can undo days or even weeks of hard work if it really gets out of hand. While some people have an easier time than others, almost everyone has to deal with hunger and cravings to one degree or another. It’s just human nature to want to indulge in food after accidental or intentional deprivation, and whether it’s normal or not, it’s still interfering with your goals. 3. You can make the overall experience of dieting more enjoyable. Make no mistake: while recreating your body with smart diet, exercise, and supplementation can dramatically change your life for the better, it’s not easy. No amount of pills or powders are going to get you there. It takes hard work, and it takes time. And this is another major reason why diets fail: people don’t want to go through the discomfort of it all. Well, like reducing hunger and cravings, making the process of dieting more enjoyable, primarily by increasing the overall feeling of well-being, makes it easy to stick to the plan and see it through. Although the molecular machinery of fat loss is vast and complex, the practical application remains simple. Contrary to what many other companies would lead you to believe, directly stimulating any of the thousands of proteins and enzymes involved in fat loss either doesn’t work or is uninvestigated. Fat loss is a whole-body process, and by focusing on simple, key, and proven targets everything else activates and functions accordingly. 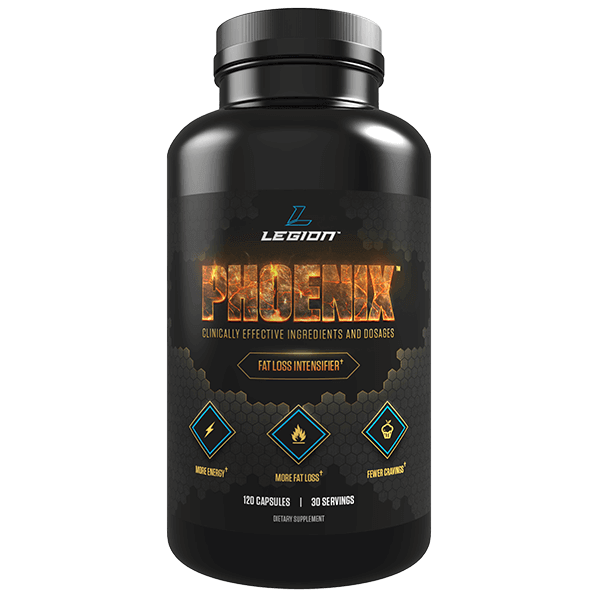 PHOENIX’s formulation is the result of an extensive scientific review of a wide variety of natural molecules known to favorably affect fat loss, and we carefully chose a handful that work synergistically to safely deliver consistent results on all three points given above. Losing weight fast without losing muscle isn’t complicated or even all that difficult, really. Sure, it takes a bit of know-how and discipline, but if you follow the advice in this article, you might be surprised at how smoothly it goes. …and you can lose up to a couple pounds of fat per week while preserving your muscle and strength. What’s your take on losing weight fast? Have anything else to share? Let me know in the comments below!